Associated Press A worker stands by a sign promoting Huawei's 5G internet services at a mobile phone shop in Shenzhen, China, last month. The Chinese tech giant faces U.S. criminal charges. 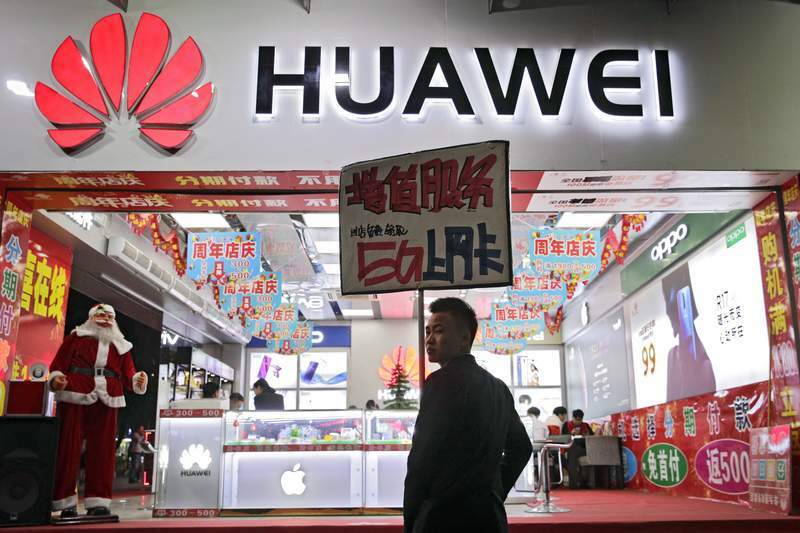 BEIJING – U.S. criminal charges against Chinese electronics giant Huawei have sparked a fresh round of trans-Pacific recriminations, with Beijing demanding Tuesday that Washington back off what it called an “unreasonable crackdown” on the maker of smartphones and telecom gear. China's foreign ministry said it would defend the “lawful rights and interests of Chinese companies” but gave no details. Huawei is the No. 2 smartphone maker and an essential player in global communications networks. A day earlier, U.S. prosecutors criminally charged Huawei and several of its officials for allegedly stealing technology secrets and violating Iran sanctions. That followed the detention in Canada of the Huawei founder's daughter – a top company official who was named in one of the U.S. indictments, and who is now awaiting extradition to the U.S.
All that has further complicated U.S.-China relations amid attempts to defuse a trade war instigated by President Donald Trump and clashes over alleged Chinese theft of trade secrets and other intellectual property from U.S. firms. A new round of trade talks are planned for today in Washington. On Tuesday, Australia's TPG Telecom said it abandoned plans to build what would have been the country's fourth mobile network because of a government ban on Huawei over security concerns. Last week, Vodafone, one of the world's biggest mobile phone companies, said it would stop using Huawei gear in its core networks. White House spokeswoman Sarah Sanders denied that the criminal charges were part of a carrot-and-stick approach to the trade talks. If Trump and his Chinese counterpart, Xi Jinping, they don't reach an agreement by March 1, U.S. tariffs on $200 billion of Chinese products are set to rise from 10 percent to 25 percent.